I love Cay Gibson’s A Picture Perfect Childhood book. This is where I found a list of picture books to read in the month of November. 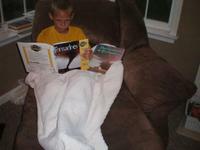 This fall I have had a lot of fun reading lots of great books to the kids which were suggested by Cay. My favorite part about these picture books is that there are some very easy recipes included in them to make with the kids. I’ve only made one meal from the books and it came out great. I love pumpkins and I hope to make some pumpkin soup sometime before Fall is over. Here is a list of the books we read with recipes inside. Have fun cooking with your kids this Fall. I’ve added all the books we are reading this year on the sidebars. We are having so much learning about many topics, especially the weather. The boys are fascinated with tornadoes and clouds. I have learned so much from them this year. I see clouds in a whole new way now. They are also enjoying all the books on germs. The kids thought You Wouldn’t Want to Be Sick in the 16th Century! was hysterical. A little gross, but very funny and they enjoyed it a lot! Adrianna, Marygrace and Cecilia are reading about the Holocaust. Those books are on the left sidebar, right under the 4th of July books. I had some of those books from our Revolutionary War unit study last fall. I find that I’m constantly putting more and more books on hold from the library. This past Spring we read all the gardening books and two of my favorite books were Katie and the Sunflowers by James Mayhew and Camille and the Sunflowers by Laurence Anholt. Camille and the Sunflowers is about a boy meeting Vincent Van Gogh, so now we are going to do an Art appreciation study this summer as well. The art books are listed on the sidebar right under the Thunderstorms and Tornadoes. It’s amazing how you can learn about one subject and that leads to something else. I am looking forward to learning about so many incredible artists. After reading Katie Meets The Impressionists to Angela yesterday, she asked me if we could go to the Art museum sometime. I’m hoping to take the kids to the National Gallery of Art this summer. 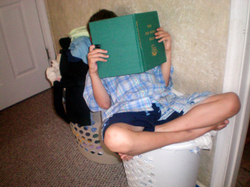 Right now Joseph is reading The Mouse and the Motorcycle and Kolbe is reading Henry and the Paper Route. As soon as they are finished reading these two books they are going to read Henry and the Clubhouse and Emily’s Runaway Imagination. So far this year they have read Runaway Ralph, Ralph S. Mouse, Otis Spofford, and Ellen Tebbits, which they couldn’t wait to read after reading about her in Otis Spofford. They also read the Ramona series. They are really enjoying these books. They go to bed with their books and read them first thing in the morning. Eventually, I might have to buy the books instead of getting them from the library. I’m sure our little girls will love them just as much. 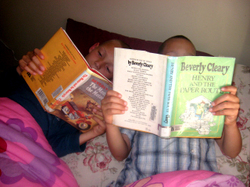 Right now Joseph is reading The Mouse and the Motorcycle and Kolbe is reading Henry and the Paper Route. So far this year they have read Runaway Ralph, Ralph S. Mouse, Otis Spofford, and Ellen Tebbits, which they couldn’t wait to read after reading about her in Otis Spofford. As soon as they are finished reading these two books they are going to read Henry and the Clubhouse and Emily’s Runaway Imagination. They go to bed with their books and read them first thing in the morning.